How important is top sprint speed for racing Cat 4/5? I build a road bike up a few months ago with the intent of racing in the spring, and my training so far is coming pretty well: except for my sprint speed. As much as I try I can't increase it at all. I hit 30mph about a month ago, and while everything else is still improving I haven't been able to sprint .01mph faster since. After a hill or with a lead-out I can go faster, but my solo effort just stops dead there. Is this something I should worry will affect my racing (and therefore spend more time working it), or should I just continue on with my training plan and not worry about it as much? 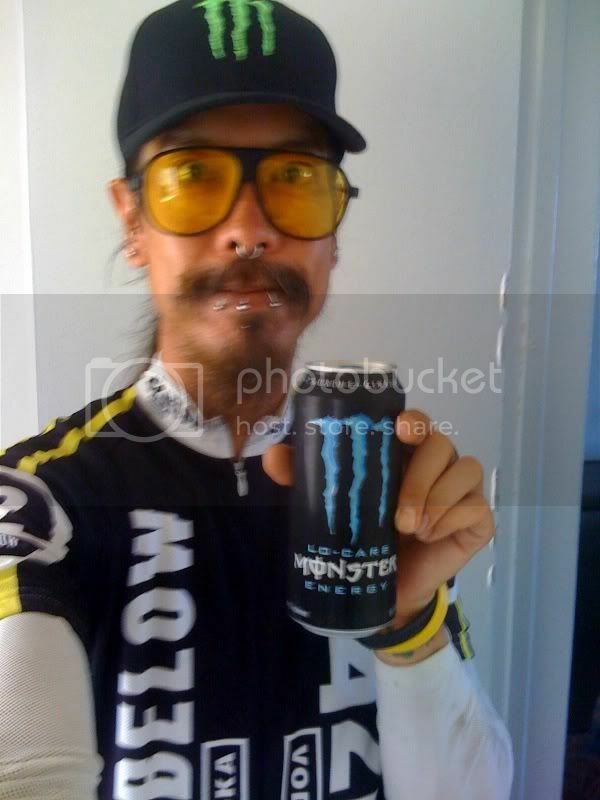 Before your next ride, drink two Monster energy drinks. Last time I did that, my flat/slightly uphill sprint speed went up to 36mph from 32. Two would effect your eyes. It's going to be fairly important in flat races and crits. In cat 4 there will be people who can pull a steady 30mph for a minute at least. I personally know some cat 4s who sprint 38mph in practice and AFAIK they still haven't won a race. They do place in the top ten fairly often though. As with all races, it's going to depend on the type of race and who is in it. If you are an awesome climber or TTist, you might pull off a win with crap for a sprint. But then an awesome TTist would be able to sustain 30mph for longer than just a peak. In flat solo sprint drills I can get it up to 33/34 or so. That is pathetic in pretty much any cat against real sprinters. I'm an ok TTist and fair climber though. I can take a few pulls in the 30mph vicinity without totally dying. A few only. I'm decent at climbing and TTing, I just can't sprint to save my life, I can sustain 25 for a few miles, and the time I can sustain 30 keeps improving, I just can't improve the actual speed. Any good drills for improving speed? I've been sprinting all out, then resting for a few minutes, then more sprinting, etc, and also doing sprints after short downhills with repeats. Anything better for sprints? Where is that excellent sprinter della casa blog post? Yeah! Where's a race for us climbers!? I can drop a lot of people on mountains, but flats and sprints kill me. I've been told that power starts are awesome sprint training. Basically starting from a near-trackstand in a very large gear and then spinning it up as fast as you can to the highest possible RPM. what you want is to increase your strength from slow twitch muscles which are utilized in low rpm efforts. could be. I don't work on sprinting by choice. Maybe not wrong, but it gets murky here. The contraction speeds are important, but so are the forces needed. Fast twitch are also stronger, so you'd expect to be recruiting more of them too. Generally, it's duffices to say that you recruit slow-twitch (Type I) first, and don't recruit many fast-twitch (Type II) until higher forces are needed. This is part ofthe argument for using a higher cadence. Really, power depends on your ability to quickly recruit many fibers in a coordinated fashion. We have a local group ride that a couple of former semi-pro sprinters and lead-out men roll along to. Usually around 40 in the group total. At the halfway point, another group ride of guys on TT rigs woosh past, and the ride becomes "drop everyone, attack and hammer". My sprint training is trying to hold the wheel of the former pro's, and in doing so it's basically simulated race conditions. Sorry for digressing, but I felt It was appropriate to add. unless you are soloing in, you're gonna have to sprint a small group or a big one if you want to win. you need to develop explosive power; those kilo track standstill starts are good. you also need technique and high cadence; seated sprints with friends are good. a game some old timers developed had you sit on a $20 bill, and you had to keep it on your seat while your mates were sprinting you trying to take it. lots of guys start their sprints on too big a gear. you also need to practise coming out of the pocket. lead out games with willing friends are fun. I would continue on with your training. If you're doing faster with a (down) hill or a leadout, that's reasonable. You'll need to be able to follow moves which are reasonably fast (30-35 mph). Pure sprinting is about power and coordination. You can work on this, but I have a feeling your first race will teach you a lot. Then you'll have a good idea of what to do - power or coordination. If you simply can't go fast, that's power. If you feel like you can go faster but you can't pedal fast enough (that's the feeling) then it may be coordination. The latter would be things like making sure you can coordinate your upper body and your legs (standing, pulling/pushing, etc). The rest of sprinting is tactics - position and reserves. The more reserves you have, the bigger the effort you can make. More than once I've gotten to 200 meters to go and I have absolutely nothing left. But since I usually look a wreck anyway, a lot of riders keep thinking I'll be sprinting, and when I never jump, they get a bit disturbed. Good position can make a huge difference, even to the point where not sprinting can get you a top 10 or 15, or sprinting like mad nets you something outside of the top 20. There's more too but that should get you started. *edit* I forgot this part - sprinting determines race places a lot, meaning you need to sprint to determine your finishing position. You need to sprint even if you're in a two man group. So knowing how to sprint is critical if you want to place in races. Climbing and time trialing are more related to FTP, i.e. steady output. It's what (I think) 99% of racers work on (2x20s, lots of efforts longer than 10-60 seconds). The same 99% also rarely work on tactics. FTP will get you to the end of races but sprinting will win you them (quote is from someone in BF, forgot who). When racers get to the end of the race, you help riders like me - I can sit in and last a little bit longer if the group stays larger. CDR - thanks for those links! Yeah! Where's a race for us climbers!? Thanks for the tips CDR, I think I'm going to take the week and just relax, do some easy riding and low-effort spinning on the rollers, then hit hard again next week. I'll try some of the exercises here and see if I can manage any real results by the end of the year. And I seriously doubt I'll do any good until I get some actual race experience, but I don't see any reason to not work on a few specifics while I've got the time. Caad - Mt. Washington Hilclimb awaits you! The Mt Washington Auto Road is 7.6 miles in length (but my computer always reads 7.8 though! ), has an average grade of 12% with extended sections of 18% and the last 50 yards is an amazing 22% sprint that to the finish! It's all uphill - perfect for guys like you and me! I don't know how cold Utah gets but in my short time in Utah the temps were really low. If you're doing this work outside, you'll naturally go slower in the cold (speeds simply decrease due to you burning energy to stay warm). If you're doing this on the trainer, the trainer will limit you to about 1000 watts, give or take, and you'll max out your speed accordingly. I like your attitude, and I think when you get around to the actual racing, you'll be fine. Like a wise sage once told me: "Train your weaknesses, race your strengths". If you want to be able to come around everyone from 15th-20th place it's critical to be able to sprint (find your way through the crowd while going fast). If you're in the top 5-8 at the final turn, things are much less difficult.